Want To Be My Book Buddy? One benefit of the combined Hamilton Southeastern Intermediate & Junior High campus is the opportunity for students to partner across grade levels. Many thanks to HIJ English teacher Ashli Cooper for sharing an experience in which older students are encouraged to read through leadership incentive, and younger students have the chance to read and learn along with the ‘older kids’! Students are our future leaders, and what better way to show them that by offering them chances to BE leaders now. This year my eighth graders were challenged to write an “About Me” paragraph — something that, by eighth grade, they have done several times. The difference? This paragraph could not include their name. In these “About Me” paragraphs, the eighth graders’ aim was showcase their best qualities in an effort to appeal to a 5th/6th grade audience. Without knowing names, the younger students read and selected buddies based solely on the power of the 8th graders’ writing. After connecting with their buddies in the library, students were asked to discuss what they like to read and select a book that would inspire all members of the partnership. Students set reading goals, exchanged e-mail communication, and discussed characterization and plot development as they worked their way through the novel. Eighth graders walked in to every meeting with a plan, and they were met with thoughtful and engaging questions from their buddies. In the end, students made text-to-self and text-to-work connections that were much deeper and broader than an assignment. Students posed challenges to one another, tempting each other with spoilers of the next plot twist or sharing a connection that inspired the other student to read just a little bit more. It is true that my junior high students led the charge in reading a book, but in the process we learned that the most important part of the “Book Buddies” process was most definitely the BUDDIES. Dr. Seuss’ birthday, of course! At Harrison Parkway Elementary, the birthday of the beloved rhyming genius and children’s author is celebrated yearly in a big way. At HPE, March 2nd is Seussical Day! As part of her commitment to Read Across America, HPE Media Specialist Kristin Sager rolls out the red carpet every March 2nd, inviting family and community readers to come share a Seuss title. First and second grade students rotate through a half day of Seussical experiences, all designed to encourage the love of literature and reading. 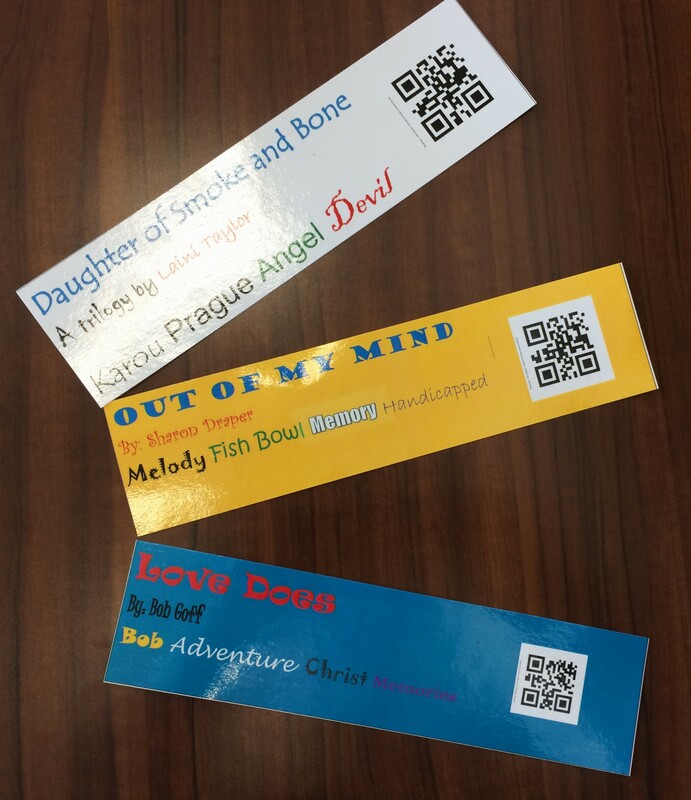 Thanks to media specialist Amy Michael of Fall Creek Elementary for today’s post! The week started with Paddington Bear posters around the school telling the kids to get ready for a bear hunt. It sparked their excitement and got them wanting more. The following week they found trivia questions posted in the hallways with QR codes. The kids had a great time scanning the codes and finding the answers to the questions. Some of the questions were geared towards the higher grades. This meant they had to do research to find the information. Another good skill for them to embrace! The library contained a non-fiction section for them as well. The students were encouraged to find facts about the bears and write them down for others to read. I knew that the first grade teachers were getting ready to kickoff a thematic unit on polar bears, so this was the perfect tie in. It was also a great opportunity for me to teach the kindergarteners how to compare and contrast the characteristics of fiction and non-fiction bears. Many fun read alouds were done with the numerous bear books. 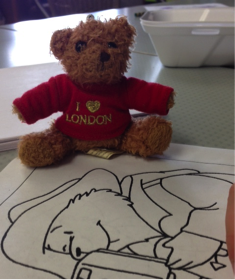 Students learned the history of Paddington, the Berenstain Bears, Winnie-the-Pooh, and many others. The week wrapped up with the kids bringing their favorite teddy bear to school! 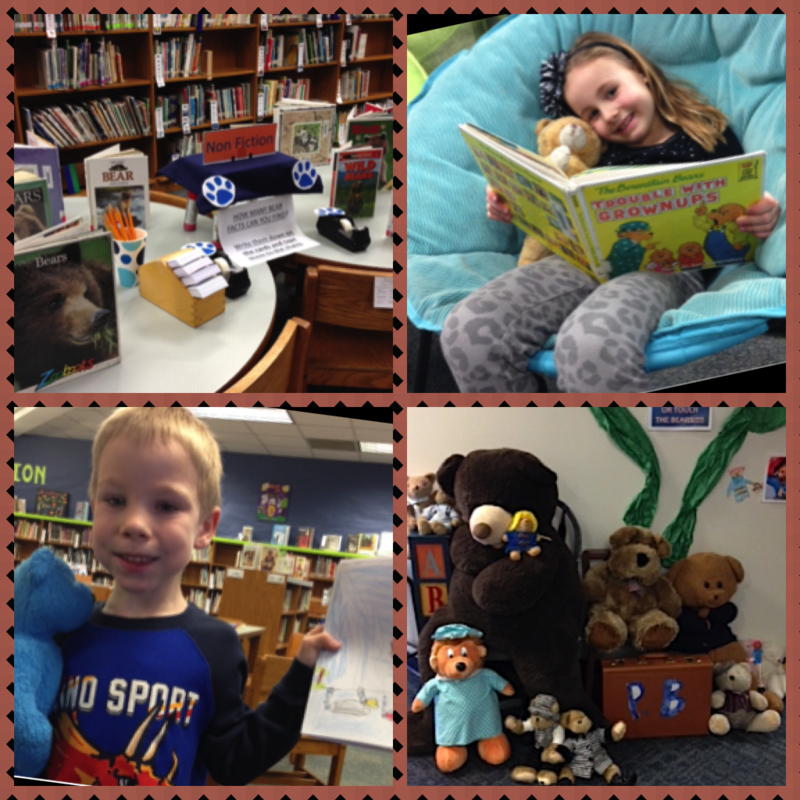 The children read to their bears, fourth graders read to the kindergarteners; the students wrote bare books with their bears, and took their bears to the library to snuggle up with a good book! 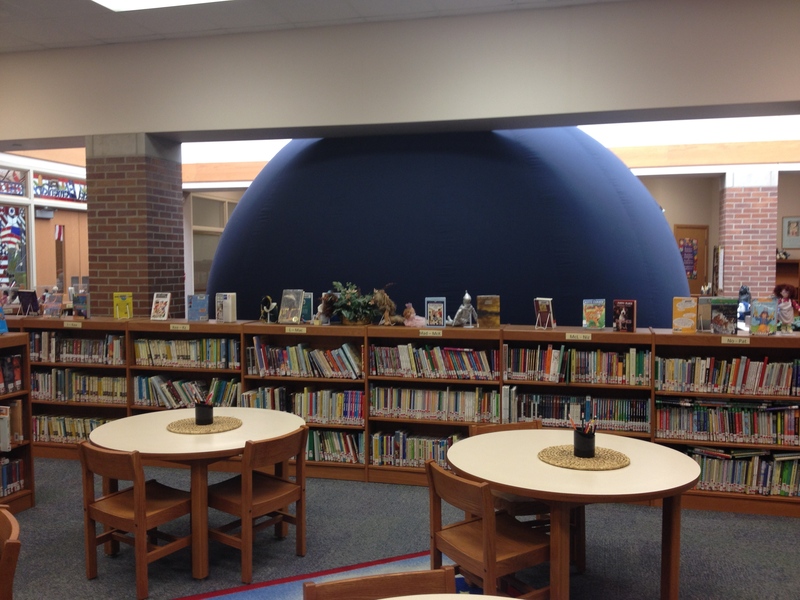 Thanks to media specialist Kelly Pidcock at Geist Elementary School for today’s post! HSE’s media specialists take the lead role in teaching digital citizenship skills in our schools. Whether at school or home, playing in their neighborhoods or surfing the web, speaking face-to-face or talking through electronic devices, Geist Elementary students are encouraged to “do the right thing and treat people right”. As Geist Elementary’s media specialist, I am passionate about teaching my students the importance of leaving a path of unmistakably positive digital footprints as they travel through the cyber world. As a result of these goals, third and fourth graders are learning about digital citizenship with instructional materials and videos from BrainPOP, Netsmartz Kids and Common Sense Media websites. The series of lessons centers around three topics: (1)responsibility to self, family and friends, and the larger community; (2)protection of private information; and (3)cyberbullying. During the final class, partners use an app called Make Beliefs Comix to create an example of a cyber bullying situation handled in an appropriate way. The comic above is one example! Lessons in Etiquette – Social Media Etiquette, That Is! 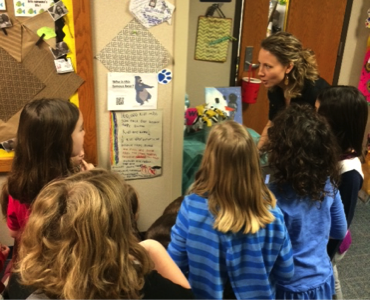 Media Specialist Sharon Deam makes the most of ‘real life’ teaching opportunities. During her digital citizenship unit this week at Fishers Junior High, Deam reminded her seventh graders that anything and everything they text or post online can affect their futures–and an NBC news report helped to prove her point! In each HSE school building, the librarian/media specialist instructs all students on digital citizenship topics such as internet safety and security, digital footprints, and more. Mrs. Deam began her recent lesson by recounting the (true) cautionary tale of a congressional aide who was forced to resign last month after she ridiculed President Obama’s daughters on social media. The aide’s demeaning Facebook comments quickly grabbed the attention of media and spread. Mrs. Deam used this sad story as a real-life picture of the importance to ‘think before you post’. In the same way that we emphasize politeness and wisdom in our physical actions, so we must live in th e digital world, using the amazing access provided by social media with discretion. Sharon and the other HSE media specialists are committed to helping our students learn these vital information literacy and digital citizenship precepts. Today’s highlight occurred at Fall Creek Intermediate School, where students received a much anticipated visit from young adult author Ben Mikaelsen! Mikaelsen traveled from his home in Bozeman, Montana, to spend a day at FCI. Teachers and media specialists know Mikaelsen as a popular and successful writer; to students, Ben is most notable for his famous family member, a 750 lb. black bear named Buffy. In addition to sharing tales of Buffy, who lived with the Mikaelsens from the time he was a cub until he passed away at the age of 26 (in 2010), Mikaelsen shared stories from his life as well as his books. 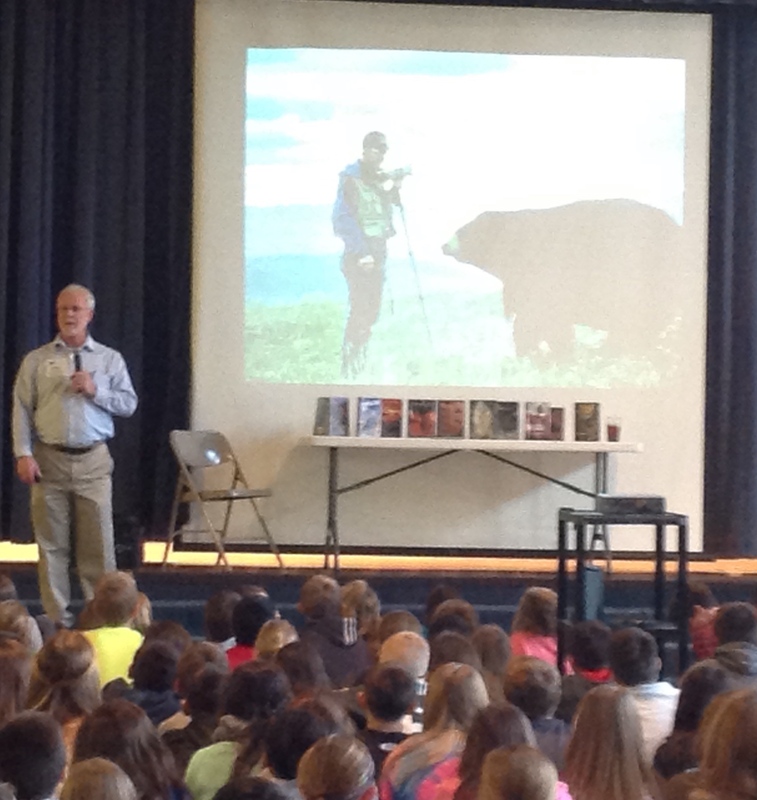 He spoke to the FCI students about bullying and his own experiences with bullies. 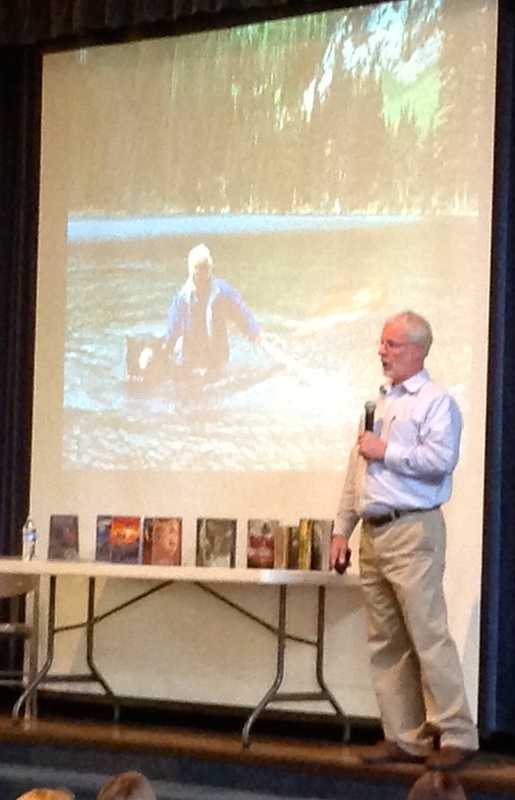 He also encouraged students to follow their dreams, again by sharing his own experiences. Both were very strong messages that connected mightily with the preteen audience. Students in Holly Miller’s third grade class at Sand Creek Elementary recently got to experience how a real city or town operates. As part of their academic standards, the class studied the wide of variety roles that a community must fill in order to function as a town/city. Then the student-driven portion of the project began! With additional instruction and resources from media specialist Laura Collier, each class member filled out a job applicati on for a role that interested him or her. Available roles included the mayor, city council member, employee of the public works or parks and recreation departments, a career with the fire or police department, and more! After a city mayor was elected and other roles assigned by interest, students practiced their research skills in the library, looking for reliable information about their chosen job. 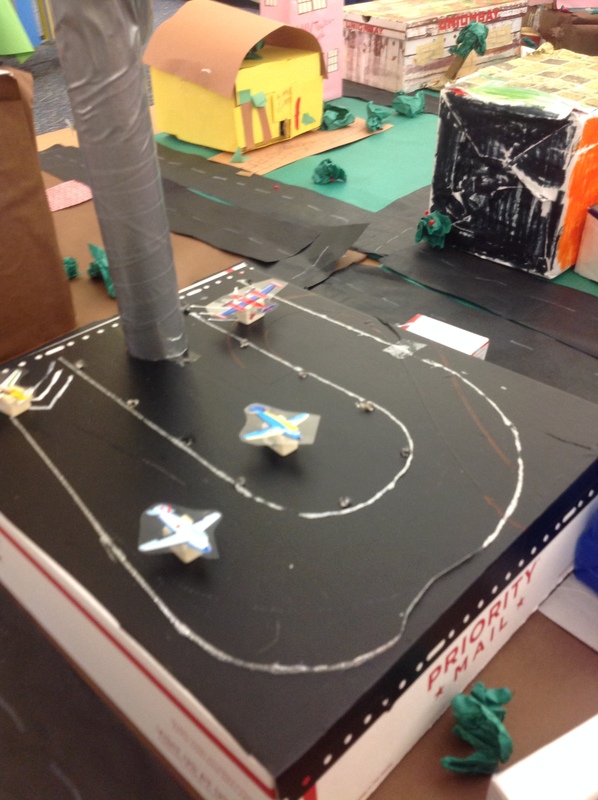 Students used that knowledge to build a 3-D representation of the town of “Millerville.” In addition to the content learned, the Millerville project gave students practice in collaboration and team-building, a visual representati on of the necessities of a town, and even included a math lesson on scale! Mrs. Miller and Mrs. Collier both declared this cross-curricular, collaborative unit to be a huge success–the students agreed! One of the advantages to having several school buildings in close proximity is the potential for ongoing connections between our youngest and oldest learners! These important connections happen twice weekly on 131st Street, when the Fishers Reading Tigers walk across the road to meet their reading buddies at Sand Creek Elementary. 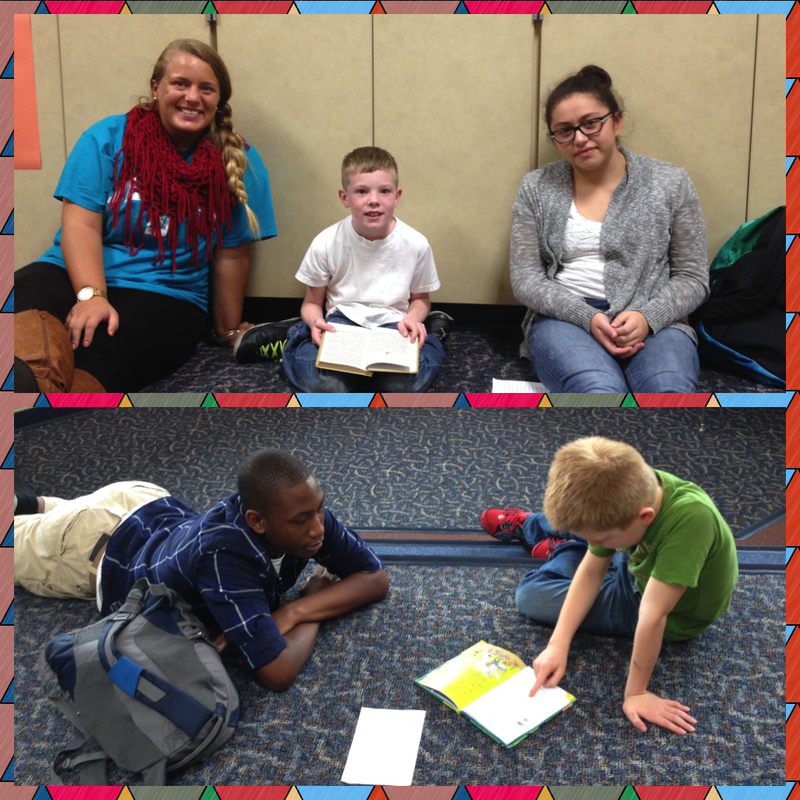 The FHS Reading Tigers program, now in its second year, pairs young readers with high school students who serve as peer tutors. This year, before reading buddy matches were made, Media Specialist Renee Isom and senior Alicia Macchione, club president, educated potential peer tutors on the basics of young children’s literature and literacy instruction in order to prepare students for their role. Walk into Sand Creek during the last half hour of the elementary school day on a Monday or Wednesday, and you’ll be sure to see reading partners throughout the halls, engrossed in stories and conversation. Each FHS teen reader connects weekly with his or her very own reading buddy. 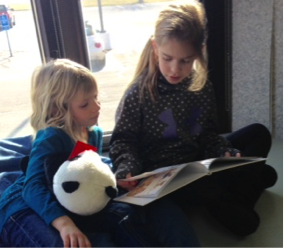 New friends are reading and learning together. Connections within a learning community. Part of the HSE21 educational experience. Curiosity. It’s inherent in every child. Great teachers foster this natural desire to understand the world — through Blobs and tales of the night sky — and in countless other HSE21 learning experiences every day.